29.10.1890: Launched by Cochrane, Cooper & Schofield, Beverley (Yd.No.41) for John Kelsall, Manchester (managing owner) as MAJESTIC. 30.12.1890: Registered at Hull (H120). 1895: Transferred to Fleetwood (Kelsall & Co, managers). 23.1.1897: Sold to Kelsall Brothers & Beeching Ltd, Manchester (John E. A. Kelsall & George Beeching, Fleetwood, managers). 4.9.1897: Registered at Fleetwood (FD181). 13.4.1899: Registered at Hull (H444). 22.10.1904: The Dogger Bank Incident. Shelled and damaged by Russian Navy Baltic Fleet while fishing on the Dogger Bank. Russians on passage to the Pacific in the darkness opened fire on the trawlers (approx 45 vessels) under the impression that they were about to be attacked. 8.9.1911: Registered office transferred to Hull (George Beeching, Hull & John E. A. Kelsall, London, managers). 26.1.1912: Sold to James S. McGillivray (64/64), Macduff (managing owner). 26.1.1912: Mortgaged to Kelsall Bros & Beeching Ltd, Hull for sum of £325 at 5% interest (A). Fitted out as a drifter. 5.1912: Registered at Banff (BF478). 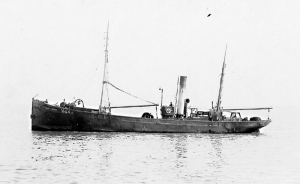 5.1917: Sold to H. Smethurst, Grimsby for use as a trawler. 25.5.1917: Registered at Grimsby (GY1054) as a trawler. 28.11.1917: Sold to Frank Crimlis, Hull (managing owner). Sold J. Johnson, Scarborough (Penguin Fishing Co Ltd). 9.5.1918: Sold to Albert W. Green, Grimsby (managing owner). 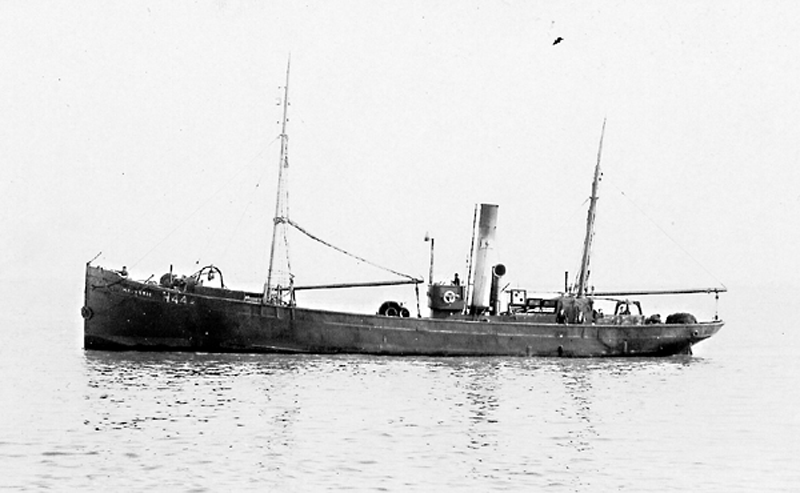 1.1920: Sold to Great Yarmouth Steam Trawlers Ltd, Gt Yarmouth (George H. Hansell, manager). 19.1.1920: Registered at Yarmouth (YH229). 1926: Sold for breaking up. 26.10.1926: Yarmouth registry closed “Broken up”. 18/01/2009: Page published. 4 updates since then. 15/09/2017: Removed FMHT watermark from image. This entry was posted in Steam Trawlers, Steamers (Picture) and tagged John Kelsall, Kelsall Bros & Beeching Ltd on January 18, 2009 by Fred Smith.